About the most exciting thing I have to report at this point is that the wireless is now working on the Raspbian install which is an improvement over the last three times I’ve plugged in that particular SD card. This is important because it means that I can finally start working in comfort at my desk rather than curled up on the living room floor. two of the three keyboards I have at my disposal did not want to work effectively – I wound up with repeating letters which made getting a password entered impossible. The third keyboard is working and to facilitate that and the new monitor, major desk reorg required. So okay, I’ve got a browser working on it; I can fire up Wolfram and Mathematica, Python is installed, what next? I am very shortly going to go and get one of the Raspberry Pi books and look into building a can’t fail media centre and I will write instructions about that here when it’s done and running. I also want to try and build a weather station. And a robot. And I want to build snake on it as well but I think I may have code for that. There are also numerous websites. Raspberry Pi’s own website and Wolfram’s site, for example. I anticipate hours of endless fun. I had a text message from a friend yesterday. He was in Calais, waiting to make the Channel Crossing with P&O Ferries. The company had texted him earlier to warn him of disruption but information was otherwise thin on the ground. In fact, yesterday, if you were a P&O customer looking for information about how your crossing was going to go, from them, your information was limited to phoning a number which was on their site. In this day and age, I think that’s crazy. My background is in the aviation sector and I know, for example, that you can, for most flight companies, get flight information through their websites and through their mobile applications. Some companies will flag serious delays via their twitter feeds and updated news information on the website. Granted, not all of them. But to a great extent, there is a recognition there that technology could be used to enhance airline to passenger communications. My friend was told his ship was likely to be 45 minutes late when he got to check in. There wasn’t any sign of a ship though. I see things like this as a challenge. And unlike him, I happened to be sitting at a computer. P&O’s most useful tweets amounted to “Your ship will be late, but check in on time anyway”. They have no useful operational information on their website. So I abandoned them and went for the shipping equivalent of FlightRadar24, a website called MarineTraffic. It’s a really nifty site and from it I could identify the two P&O ferries which were en route from Dover to Calais and made an educated guess which one he would be most likely to be getting on. From that, I could tell him how far away his ferry was and at approximately what time it would arrive in Calais. If you’re sitting on a quay in the wind and rain, and all you have to go on is your ship will probably be leaving 45 minutes late, and someone sends you a text and says “your ship is 15 minutes away from Calais at the moment”, this helps a lot. A few weeks ago, my friend did likewise for me when I was sitting in the gate area at Charles de Gaulles in Paris waiting to come back to Dublin; he checked what time the outbound flight from Dublin had left and we estimated what time the return would be leaving. People hate delays at the best of times, but delays with no concrete information, that’s really not great either. There are two messages I take away from this. P&O could do a lot more to inform their passengers both via twitter and via their website. People don’t tend to want to calling automated phones for operational information any more. It’s old technology and it’s largely been superceded. Very often, even though the information is not straightforwardly available, it can be found somewhere. I found it and passed it on, up to and including what the state of play was later with the number of ferries arriving in Dover at approximately the same time (there were three queued up at one point). So what would I suggest? Well, P&O need to feed operational information regarding delays to their twitter feed. My guess is that they don’t want to do this in case people just show up late to check in but people’s time is money. Perhaps we need to find away to accommodate late check in when we know a ship is going to be late. And they probably need to feed that information onto their own website although I have to say, I hope they are considering a website redesign. The site could do with it. Marinetraffic.com has an iPad application which was very useful later when I was AFK. I’m not sure how it would behave on a phone but it definitely was better than the website is through a browser. It could well be worth the investment if you’re travelling by sea during the winter when delays and cancellations are more likely. The Journal website published a story on Food Poverty in Ireland which you can find here. Its main selling point is that the numbers apparently at risk of food poverty are shown on a map of Ireland. It was based on a release by Unite and Mandate and you can find a text from them on the subject here. It’s titled Hungry for Action – Mapping Food Poverty in Ireland. The map, I suppose, is eye catching. But I don’t think it really works to communicate the problems. For me, the first issue is that the absolute figures are fairly meaningless. 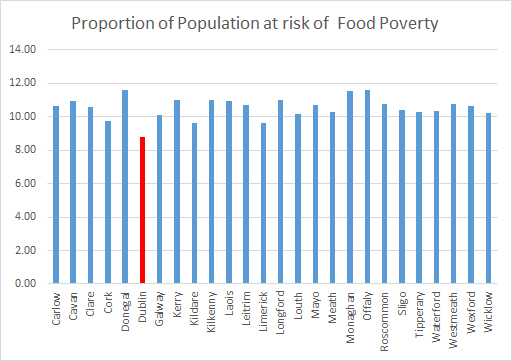 Yes, it’s horrible that 112,300 people are at risk of food poverty in Dublin but if you actually take the food poverty figures and calculate them as a proportion of the population for each county, you realise that actually, proportionally, the risk of food poverty is comparatively lowest in Dublin as a proportion of the local population. Dublin has the lowest proportion of its population at risk of food poverty when we split the population as a whole according to counties. And that’s before you even look at how the figures are generated in the first place. So here’s one big problem already. We can’t really rely on the figures. They are based, to some extent, on guess work, and on an assumption relating to income levels. And they come with the following health warning: They are based on a government study from 2010 which did not break down its global figure according to county. It should be noted that the above estimates are likely to be conservative. What worries me here is that the figures, as provided in the map graphic, are akin to guess work. They are a breakdown of a national figure with no corresponding data available at county level to even base an extrapolation on. Put simply, we actually don’t know how many people are at risk of food poverty and certainly not split according to county. I’m not sure I agree with releasing a report like this given the caution and caveats with which the figures need to be approached. The map shows Dublin fares worst with 112,300 people suffering food poverty. Larger counties like Cork and Galway follow close behind, with 50,500 and 25,300 people in need of assistance respectively. The key problem with this is that – if we accept the figures as being in any way indicative which I have doubts about, Dublin’s figure as a proportion of the population is actually the lowest. It’s highlighted in the graphic above. 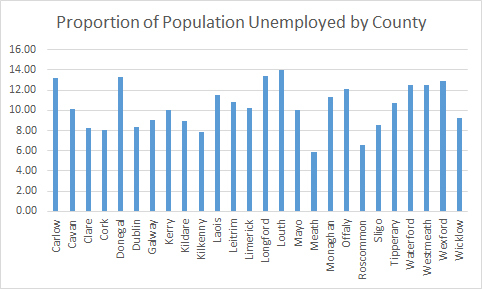 It’s scant comfort to anyone in that situation of course, but comparatively, the worst off counties are Kerry, Kilkenny, Longford, Monaghan, Donegal and Offaly. Dublin is actually the best off. In certain respects, it doesn’t tell us the story of food poverty in Ireland in real terms. Choice of graphic is very important. This one does not bring any more to the story I think than a table of figures would have. There’s no way by which you can seriously – and justifiably – compare what’s happening in Dublin with, say, what’s happening in Donegal. The figures are not based on any meaningful data. This is evident because they took a national figure from 2010 and extrapolated it out into county subdivisions using a weighting of some things which is not clear from the document provided. I went and plotted live register numbers per county as a proportion of population (nB, not as a proportion of available labour force because I don’t have those figures to hand at the moment) on an expectation that the shape of the graph would be broadly similar. It’s not. In other words, I don’t think the story is as a simple as figures shown a map of the country with numbers on each county would you have you think. I used Excel to generate the charts because I was in a hurry. Sorry. Normally they’d be done with R.
Am I saying that we can dismiss the issue of food poverty in Ireland, yerra it’s all grand really? No. I’m not saying that. What I think needs to be done is actual research into the area. I don’t know how you measure it. Maybe you talk to the food support charities, the soup kitchens, the soup banks and you get a sense of changes to demands on their infrastructure in a scientific way rather than relying on anecdote. When society has a problem, it’s best to know as much as possible about that problem rather than guessing the extent of it. Ireland is not a big country. What I do feel, however, is that this document, this piece which Mandate/Unite have pushed out is not the best way to do it. I’m not criticising the need to raise awareness of issues surrounding food poverty in a developed country. I’m just suggesting that using a bunch of figures which appear to have little underlying data is not really the best way to go about it. If they have data, it would be nice to see it. Sunday morning is when I get to read most of the stuff I bookmarked during the week. Which means occasionally I notice stuff which I might not if I had been reading all along. This morning, I have read yet another treatise on “don’t comment, just write better code” where Hungarian notation was the panacea for related problems (again) (argh). It’s one of a theme – I’ve already written about this another time so I won’t go too far into the details of that this time. But I program,. and I work with programmers and yes, there are programmers who don’t like commenting their code, and who don’t like writing documentation. This week I also read something – probably a tweet now that I think of it – suggesting that people should learn how to set up a server in school. We also get that people should learn how to program in school. You know it’s tech specialists coming up with these ideas because non-tech specialists say generic things like “learn computers”. I’ve also gotten stuck in arguments with people about how using computers should be hard to use because they were complicated .I wrote about that at the time as well by the way. And arguments about punishing users. I wrote about that too. What occurred to me here was this. All of these are gaps in communication and the suggestion on the parts of those who do not have the communication skills expect others to fill different gaps so that they don’t have to fill their communications skills gap. Other people should learn to read my code so that I don’t have to document it effectively. Other people should learn to program so that they * understand * and I don’t have to document my code properly. Other people should learn more about technology so that I don’t have to communicate gaps – which I designed – effectively to them. Computers should be hard to use because they’re complicated so that I don’t have to make it easy for users. I’m seeing a theme here. Tech workers don’t value communication skills enough and blame other people for their gaps in that area. He admits to some pushback from students over required communication courses. In my view, this issue isn’t limited to potential data science students at the Illinois Institute of Technology. Not everyone is technical. The impression I get from some technical people is that other people should develop technical skills so that they don’t have to develop communications skills. It’s just I think the world might be better if everyone developed better communication skills across the board first and didn’t argue the “well learn more about my specialisation before you annoy me with inane questions”.